Yariv Aloni, viola; Sydney Bulman-Fleming, piano JulyDec. 14, 1994! concerts 1-24: one CD each concert. (2) our own recordings of concerts, some of which we make into consumer-usable CDs. December 12-14-16: Trio Celeste - The Beethoven Trios on three CDs. $10 each; 3 for $25. The Late Brahms piano works (op. 76, 79, 116, 117, 118, 119) Two CDs. McIntyre, Bobcats and Butterflies; Brahms, variations/fugue on a theme of Handel. Nicolai Medtner (1880-1951) "Sonata-reminiscenza" in a, Op. 38; Two Fairy-tales (op. (4)Penderecki Quartet with Francine Kay play the rarity by Juliusz Zarebski (very interesting piece, and powerhouse performance); Bartok No. 3 and Penderecki No. 3 complete this terrific disc. 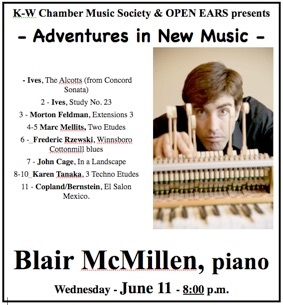 (5)Keenan Reimer-Watts and five fellow students at the Faculty of Music, WLU, play Brahms Clarinet trio, Brahms Piano trio no. 3 in c; Chopin, Barcarolle; Reimer-Watts, three preludes. Amazing performances and a fine program make this a good stocking-stuffer! (6)Ensemble Made in Canada put on two wonderful concerts on December 3 and 6. They have approved us making CDs of these, and they are now ready. Programs: (1) Debussy violin sonata, Milhaud 4 Pictures for Viola and piano; Faure, Piano Quartet no. 1; (2)Debussy cello sonata; Ravel Duo for violin and cello; Faure, Piano Quartet no. 2. Each concert is a disc, $10. We have a lot of discs in each category. Write to us (kwcms@yahoo.ca) if you are interested in a recording of a concert you’ve seen but isn’t listed here - we may have it, or be arranging to get it. It will also list news about recent special things, discs relevant to upcoming or recently past concerts, and so on. This page will divide into three categories: News; List of Commercial CDs; List of our own concert CDs. Our standard prices are: $20 for most of the commercial CDs; $15 for several, and $10 for some of them; and occasional double-sets, usually at $30. They do not have commercially-printed covers etc, and come either in plastic sleeves or in very slim rigid plastic “jewel boxes” - your choice, with the sleeves (which are cheap, durable, and very space-economical) being the “default” option. Now that there are NO good classical CD stores in the community, you may find our modest offerings a helpful resource for that small gift for the person with the kind of taste that our discs would appeal to. - And, att Christmas - they do make good stocking-stuffers!